If this card is Normal or Special Summoned: You can send 1 Thunder monster from your Deck to the GY. 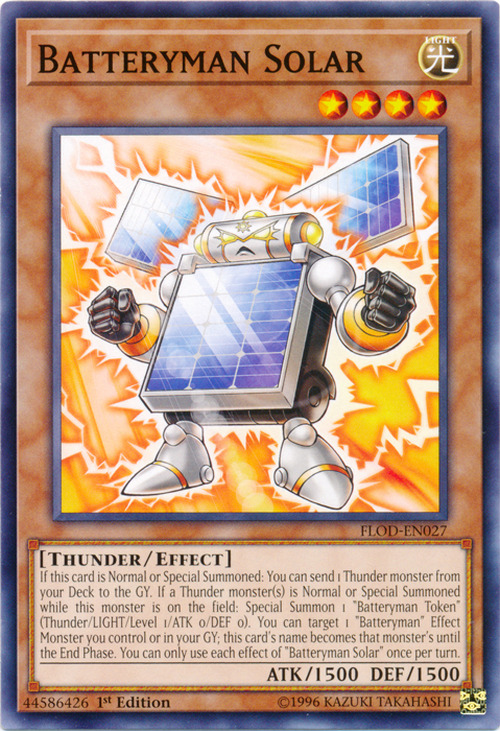 If a Thunder monster(s) is Normal or Special Summoned while this monster is on the field: Special Summon 1 "Batteryman Token" (Thunder/LIGHT/Level 1/ATK 0/DEF 0). You can target 1 "Batteryman" Effect Monster you control or in your GY; this card's name becomes that monster's until the End Phase. You can only use each effect of "Solar Batteryman" once per turn.